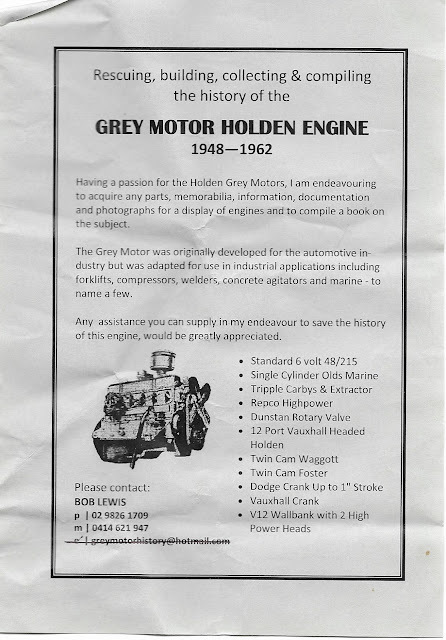 Having a passion for the Holden Grey Motors, I am endeavouring to acquire any parts, memorabilia, information, documentation and photographs for a display of engines and to compile a book on subject. The Grey Motor was originally developed for the automotive industry but was adapted for use in industrial applications including forklifts, compressors, welders, concrete agitators and marine - to name a few. Any assistance you can supply in my endeavour to save the history of this engine, would be greatly appreciated.